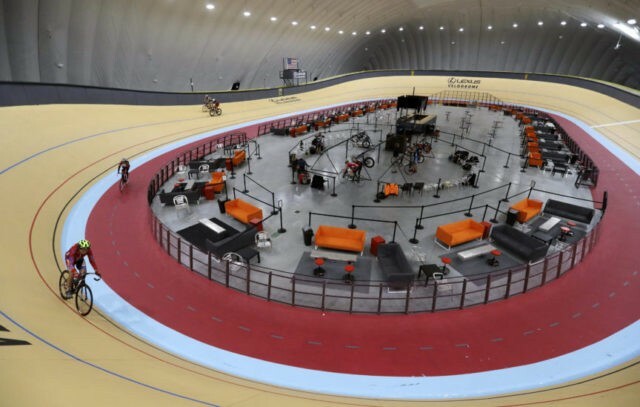 DETROIT (AP) — An indoor cycling track in Detroit is expected to draw bike riders from other cold-weather states and across the U.S. while giving inner-city youth the opportunity to participate for free in the fast-moving and growing sport. The velodrome diversifies Detroit’s sports offerings and continues to push the story of the city’s turnaround, said Kris Smith, Detroit Sports Commission director. “It’s very important to understand who is riding the bikes now … millennials who are looking to be more active, do more things, get out of their cars and go for a bike ride,” Smith said. Those and other events “could potentially put Detroit on the international map for cycling events,” Smith added. An anonymous donor with a penchant for cycling put up $5 million for Detroit’s velodrome project, said Dale Hughes, who designed and built it. He also runs the nonprofit Detroit Fitness Foundation which operates the velodrome. Hughes has designed and built about two dozen velodromes around the globe. Locally, he’s also built an outdoor track in Rochester Hills, north of Detroit.